NEW YORK (92 News) – Pakistan has handed over dossiers to UN Secretary General Ban Ki-moon containing “evidence” of alleged Indian involvement in terrorism in the country, while Advisor to Prime Minister on Foreign Affairs Sartaj Aziz warned Afghanistan of leveling baseless allegations against Pakistan. 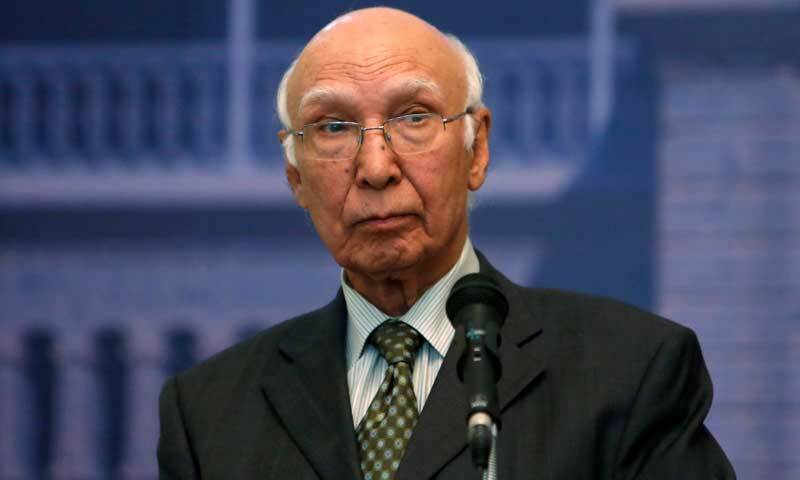 Addressing a press conference in New York on Friday, Sartaj Aziz said that India is involved in terrorist activities in Karachi and Baluchistan, adding that the Ambassador Maleeha Lodhi has handed over the dossier containing proofs of Indian involvement specially in FATA, Balochistan and Karachi to UN Secretary General. He said that Pakistan has also apprised foreign ministers of 15 countries of Indian aggression on the Line of Control (LoC) and Working Boundary. The Advisor said that India is violating the ceasefire agreement, adding that Pakistan has always desired to resolve all disputes with India through peace talks. He said that India has been feeling dialogues using false pretexts, while India is stressing only on terrorism. Sartaj Aziz said that certain elements are trying to use the global war on terror as a pretext to crush oppressed people’s struggle for self-determination.